Housing in Sonoma County was the top priority for political, business and philanthropic leaders who met last year after the devasting 2017 fires destroyed more than 5,100 homes. Since that first meeting participants hit the ground running to ensure the region not only recover lost housing, but also establish an environment to create new and affordable housing. “We’re organizing a grassroots campaign to be pro-housing to support projects that come up,” said Santa Rosa Metro Chamber CEO Peter Rumble on the establishment of the Sonoma County Housing Council, which brings together 15 of the region’s largest employers to invest in housing projects and is in the process of establishing a local housing trust. 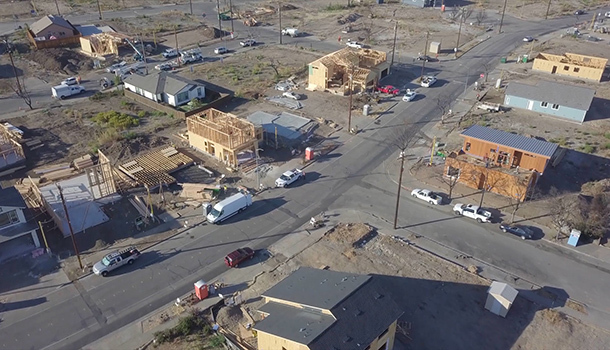 While the Santa Rosa Metro Chamber was creating the Housing Council, the City of Santa Rosa was laying the groundwork to make housing a priority. Rumble agreed, “What that disaster did was eliminate excuses for people to stay on the sidelines. We could complain about the housing shortage all day before the fires, but really that kind of stripped away the excuse to not participate.” He added that the narrow defeat of Santa Rosa’s Measure M Housing Bond (received 61 percent of the vote, short of the two-thirds needed to win) in 2018 showed that residents want to support housing. The work being done in Santa Rosa and Sonoma County could be a model on how to address the housing crisis throughout the state.